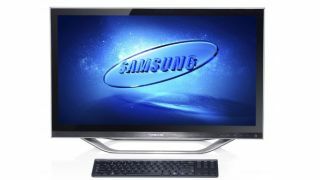 With IFA 2012 just hours away, Samsung has unveiled the first of its new tech line-up, the Samsung Series 5 and Series 7 all-in-one Windows 8 PCs. The Samsung Series 5 PC will come running Windows 8 (64-bit) on an Intel Core i3 3220T Ivy Bridge processor and Intel HD Graphics 4000, backed up by 4GB of DDR3 at 1600 MHz and a 500GB HDD. The 21.5-inch screen has a sweet sounding resolution of 1920x1080 pixels, with 10-point capacitive touchscreen and a 1.3MP webcam for video chat and gesture control. If you don't fancy prodding or waving at the screen though, the Series 5 comes bundled with a wireless mouse and keyboard set. Port-wise, we're looking at three USB 2.0 inputs, two USB 3.0s, an HDMI in/out and a multi-card reader – plus a DVD read/write drive to round things off nicely. You can get your mitts on the Samsung Series 5 all-in-one Windows 8 PC on its release date of October 26, with US pricing set at $749 (UK TBC, but should be around £500ish). The Samsung Series 7 comes in a little bigger, with a 27-inch touchscreen rocking 1920x1080 resolution, a beefier i7 processor coupled with an 8GB DDR3. The 1TB hard disk drive should keep things as lean as the PC's design, with the bundled wireless keyboard and mouse keeping things physically neat. You can also nab a Series 7 PC in a 23.6-inch variant, which offers slightly lower specs to keep costs down – it's still running Windows 8 with the 1920x1080 resolution display, but its processor is the i5 paired with 6GB DDR3 – although you do still get the 1TB hard disk drive found on the 27-inch edition. Like the Series 5, the Samsung Series 7 release date is set for October 26. The 27-inch model will set you back $1699 (around £1100), while the smaller edition comes in at $1099 (around £700). If these don't tickle your fancy, don't worry – there'll be plenty more Windows 8 hardware to be seen at IFA 2012 later this week, so stay tuned.